Access: Two hours by bus and train from Matsumoto City, Nagano Pref. Designated on December 4, 1934. Highest peaks of Hotaka Mountains: Mt. Hotaka 3,190 m (10,466 ft), Yarigatake 3,180 m (10,433 ft). Kamikochi is a highland basin surrounded by high and steep mountains called the Japan Alps. The basin spreads out along Azusa River that flows down from one of those mountains, Mt. Yarigatake. One of the most scenic mountain spots in the country, Kamikochi attracts a great number of visitors: the mountain views are magnificent and the scattered lakes and clear waters of Azusa River create the beautiful scenery. Kamikochi is also the gateway to the surrounding peaks and charms many mountain climbers. The area belongs to Chubu Sangaku National Park and is designated as a Special Natural Monument. In Kamikochi, not many large trees are seen, because tree cutting started here in the 18th century and almost all trees on the ground level had been cut down by the mid 19th century. Later, cutting of trees was prohibited and stock farms were closed in order to preserve the forest. 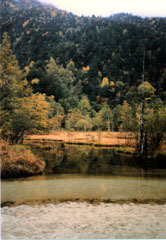 What makes Kamikochi look as it is today are the trees that grew naturally or were planted thereafter. At the center of Kamikochi lies Kappa Bridge over Azusa River. The view from the bridge is marvelous, especially when the larch trees along the river banks put on their autumn colors. The bridge was named after a novel "Kappa" (1927) written by a noted writer, Ryunosuke Akutagawa (1892-1927), based on his experience of climbing the Japan Alps in 1920. Kappa is an imaginary water sprite in Japanese folk tales. Lake Taisho at the south end of the basin was formed in a single night in 1915 when eruptions from Mt. Yakedake blocked the stream of Azusa River. The withered trees that rise up from the bottom of the lake and the reflection of Mt. 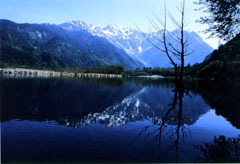 Yakedake on the crystal clear lake surface are regarded as typical scenery of Kamikochi. Walter Weston, a British missionary who introduced modern mountaineering to Japan, first visited Kamikochi in 1891, and repeatedly came back to climb the surrounding peaks. In 1896, he returned temporarily to Britain and published "Japan Alps -Climbing and Exploration-," which introduced the mountains of Japan to people in Europe for the first time. Thanks to Weston's efforts, mountaineering as a sport spread in Japan, and in honor of his great achievements, a monument featuring his portrait carved in relief was erected on the bank of Azusa River in 1937. Today, the Weston Festival is held on the first Sunday of June at the beginning of the mountain-climbing season, when many mountain-lovers trace the same trails crossing the ridges as Weston did in his days. Photos: (Top) Lake Taisho and the peaks of the Northern Japan Alps (Nagano Prefecture); (middle) Autumn colors on the bank of Azusa River (JCIC).